It's 1925 and You're Building a House... What are Your Options? Let's say it's 1925 and you want to build a new house for your family. What are your options? This was the most expensive option. Like today, architect fees could run 2-10% of the entire project. Not only would architects create custom plans and specifications, they would often supervise the construction. Many middle-class families needed a lower-cost option so they would have a local carpenter or builder draft the plans, rather than use a licensed architect's services. 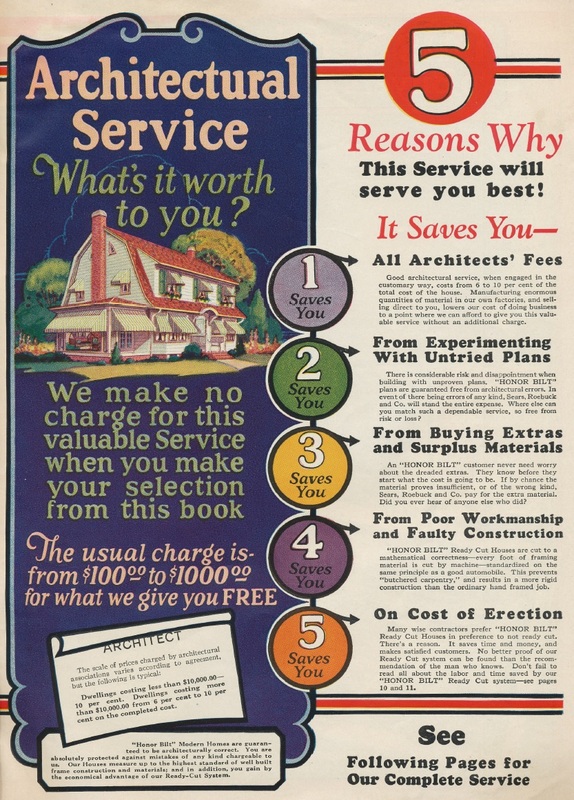 If you didn't want to pay a few hundred bucks for an architect (a lot of money in those days), you could buy an architect's design from a plan book. A plan book contained hundreds of houses. You picked one out, paid the company $20 or so, and received a complete set of blueprints, a list of needed materials, and legal forms and contracts to be used with the builder. 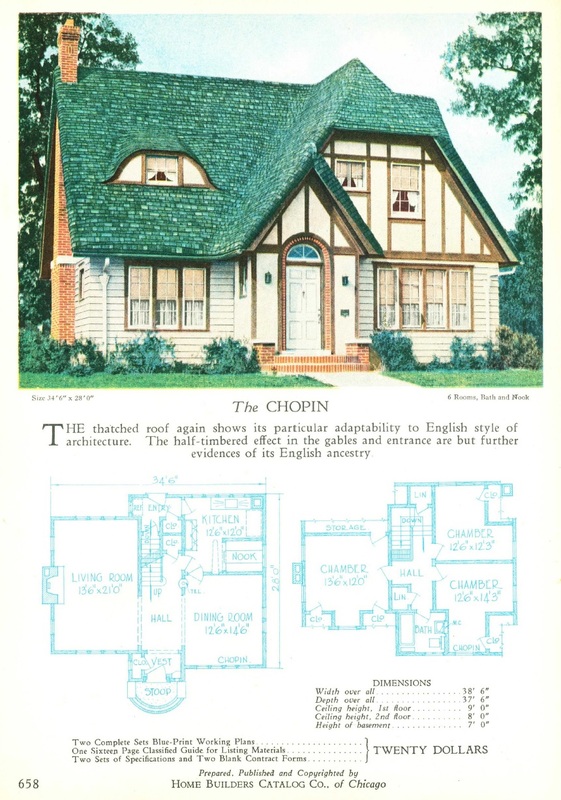 The Chopin from the 1927 Home Builders Catalog. The blueprints were $20. The plan book companies could modify a standard plan for a nominal fee. Customers who purchased a standard plan often hired a builder because few non-tradesmen were able to translate the blueprints. Many builders handed out copies of the plan books to prospective customers and had the books branded with their names. Local lumber companies often distributed branded plan books as well, and they told the customer it would be simple for them to fulfill the lumber order. 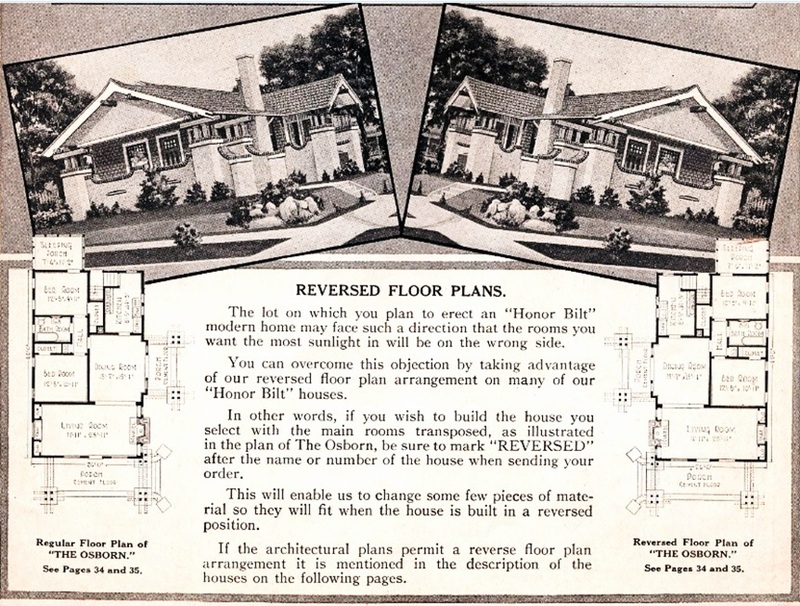 If you purchased a house from the Sears Modern Homes catalog (or one of Sears's competitors), you received a set of architect's blueprints included in the order and most of the material needed to build the house, including lumber pre-cut to desired lengths. Many of the Sears models were designed by nationally renowned architects, that most American families would never have the money to hire. Sears asked, "Why spend money on an architect?" in the 1928 Modern Homes catalog. It's apparent why the lumber companies and professional architects were threatened by the kit home industry. In the 1910's, kit houses were referred to as "freak-built houses" in an attempt to scare consumers. A 1913 ad from the Chicago Millwork Supply Company, a vendor threatened by the kit home manufacturers that offered millwork and lumber for less. Sears could customize the floor plan, or reverse the plan for no charge with most models. Gordon-Van Tine and some of the other kit home manufacturers charged a nominal fee to do so. You could hire a builder to put together your kit house or do it yourself. Sears provided an instruction book and detailed blueprints, specifically designed for the first-time home builder.